The flag on the second hole blows in the wind during the third round of the Hyundai Tournament of Champions golf tournament at The Plantation Course earlier this month. Photo by Brian Spurlock of USA TODAY Sports. Hyundai Motor of America announced Wednesday it will end its sponsorship of the Tournament of Champions at Kapalua’s Plantation Course. Hyundai will take over the Northern Trust Open event at the Riviera Country Club in Los Angeles in 2017, after being the title sponsor of the Tournament of Champions on Maui for six years. On Tuesday, the PGA Tour announced that Northern Trust will replace Barclays as title sponsor of the first FedExCup Playoff tournament held annually in the New York/New Jersey area, also beginning in 2017. 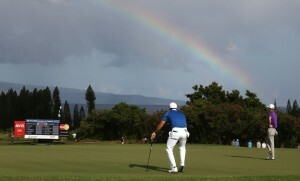 Hyundai has its U.S. headquarters in Fountain Valley, Calif.
PGA golfers Jason Day and Justin Thomas putt on the third hole with a rainbow behind them during the third round of the Hyundai Tournament of Champions golf tournament earlier this month at Kapalua Resort. Photo by Brian Spurlock of USA TODAY Sports. 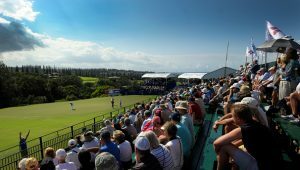 The Tournament of Champions will be held at Kapalua through at least 2019 under a 10-year contract held by the Seoul Broadcasting System (SBS) of South Korea that originated in 2010. 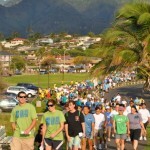 SBS was the title sponsor of the 2010 Kapalua tournament after Mercedes-Benz USA ended its title sponsorship in 2009 after 16 years. World No. 1-ranked golfer Jordan Spieth won the most recent Tournament of Champions at Kapalua on Jan. 10 with a 30-under-par total of 262. The 2017 tournament is scheduled to take place at the Plantation Course Jan. 5-8. 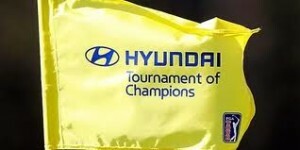 An important aspect of Hyundai’s sponsorship of the Tournament of Champions has been its charitable work through Hyundai Hope On Wheels, a national independent 501(c)(3) nonprofit organization committed to helping kids fight cancer. 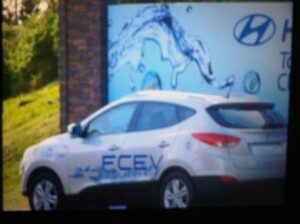 The program is supported by Hyundai Motor America and its more than 830 dealers nationwide. In association with the Hyundai Tournament of Champions, more than $550,000 has been donated to the Kapi’olani Medical Center for Women & Children. PGA golfer Jordan Spieth signs autographs on his way to the first tee during the third round of the Hyundai Tournament of Champions golf tournament at Kapalua Resort earlier this month. Spieth won the 2016 event. Photo by Brian Spurlock of USA TODAY Sports. Beginning in 2017, Hyundai Hope On Wheels will be integrated into the charitable activities of the tournament. The PGA Tour is committed to identifying a new title sponsor for the Tournament of Champions in Hawaii. 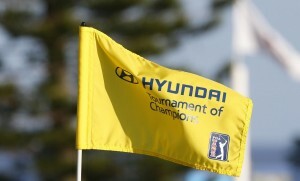 Hyundai will be aligning with one of the longest-running tournaments on the PGA Tour. It debuted in 1926 at Los Angeles Country Club as the Los Angeles Open. The tournament was staged at various courses throughout the Los Angeles area before permanently settling at Riviera Country Club in 1973.